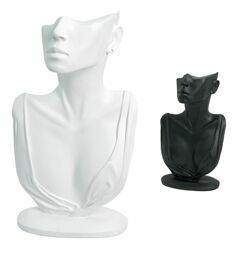 Freestanding elegant female bust display is an eye catching necklace, earring display. 12.5"H x 6"W x 3.5"D. Made of polystyrene. Item #: ACL3 Price: $24.00ea Colors: black, white, black velvet.